Diving equipment has really come a long way over the years. There have been many great advances that make the sport of diving more accessible to pretty much everyone. Dive Computers are one of the major reasons why diving has become safer and easier these days. During a dive, nitrogen can quickly be dissolved into your body tissues because of increasing pressure the deeper you descend into the water. If too much nitrogen has dissolved into the body, you can experience what is called decompression sickness. In most cases, decompression sickness is mild and does not cause significant harm but in some cases, it can lead to numbness, paralysis, and even circulatory shock. Keeping dissolved nitrogen levels within acceptable limits will limit your chances of experiencing decompression sickness. Dive computers and dive tables are used by scuba divers to calculate the depth and time of a dive so that they can avoid decompression sickness. While dive tables have been used for many years, dive computers are quickly replacing them. If you are wondering, “Why use a dive computer?” I’ve listed the top five reasons why you should be using a computer. A dive computer can provide constant tracking of decompression status. 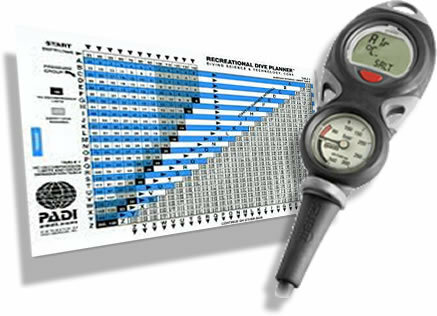 The purpose of using a dive computer is to help prevent diver’s disease or decompression sickness. It will give you more freedom on your dive because you will be able to constantly track decompression as you descend into deeper depths. Dive computers can accurately calculate the amount of time you should be allowed underwater because it can take into account the changing depths when diving on multi-level dives. If you would calculate your allowed bottom time using only a dive table, you would not be able to take into account the amount of time spent at shallow depths compared to deeper levels. One of the hardest things to do when diving is to accurately determine the bottom time and max depth of a dive. Often, these figures are not accurately recorded making dive table calculations imperfect. If you use a dive computer you can completely eliminate your worries about dive time and maximum depth inaccuracies. You know that it is important to ascend slowly from your dive. Going faster than the usual rate of between thirty and sixty feet a minute might increase the chance of experiencing decompression sickness. While a dive table may tell when you should ascend from a dive, it cannot tell you how fast you are actually ascending when you are diving. Dive computers, on the other hand, have built-in ascent rate monitors that will warn you if you are coming up too quickly. Air integrated dive computers provide additional information such as cylinder pressure and the amount of air supply still left. These can be difficult to calculate in different diving conditions, so having a dive computer with an air integration component is a great safety feature which can help to prevent a running out of air emergency situation. In concluding, using a dive computer provides many safety features. It allows novice and experienced divers to eliminate the problem of inaccurate information and potential misuse of dive tables. Your scuba diving computer should not completely replace your dive table but be used in conjunction with them. Although they are incredibly accurate and reliable, they can sometimes fail. Let’s say your planning a dive to 100 feet, when you get there it should say you have a bottom time of 20 minutes but instead it says you have a bottom time of 60 minutes. Without the knowledge of your tables, you would not know that your dive computer is malfunctioning. There is no doubt that dive computers will give you the freedom to enjoy your diving experience more fully. Letting you spend more time in the water at greater depths because of more accurate body nitrogen loading calculations. So, if you are a diver that serious about the sport then I would defiantly recommend purchasing your own dive computer. What Are The Best Dive Computer Watch? How To Choose A New Dive Computer?